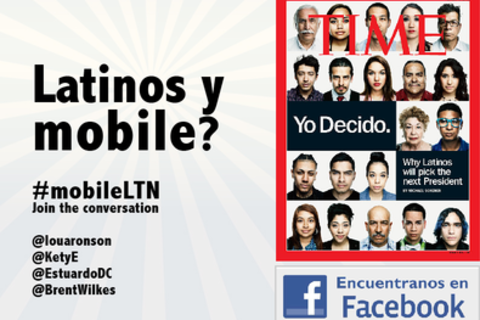 Latinos y Mobile: A Silver Bullet? As the numbers of Latinos in the US continues to grow, we have heard that mobile will solve the digital divide in empowering the Latino population but what does that mean are we making the correct assumptions? Our panel brings in experts from all sides to explore the impact of the Hispanic voice on technology and, in turn, the impact of technology on the Hispanic voice. The panelists bring experience in politics, caused based organization, commercial campaigns and mobile in order to uncover trends in issue identification and activation around the Latino community as a whole and the subsets within that whole. Much like the consumer today can choose between various tablets and smartphones for functionality and personal identification the Latino Community is not one size fits all community. The Latino community in the U.S. today is one of the most dynamic and diverse of all communities from a socioeconomic, racial, political and country of origin perspective. We explore this diversity. Kety Esquivel is a digital executive, entrepreneur, strategist, author and television commentator. She leads the digital practice for Fenton’s Western region. Esquivel’s commentary has been featured in the Wall Street Journal, PBS, CNN, Televisa and Univision. Her work has taken her to China and Ethiopia with the UN Economic Commission for Africa. She has directed Latino outreach for a presidential campaign, was the first new media manager for the National Center for La Raza and served as the interim CEO for Latinos in Social Media (LATISM). Most recently, she was a VP with Social@Ogilvy. Her clients have included the Centers for Disease Control and Prevention, the U.S. Department of Health and Human Services, American Express, Huggies, Mexico and PBS. Esquivel has been a convener for Web of Change, She’s Geeky. She was a founding board member of the Hispanic Public Relations Association National Capital Chapter and the New Leaders Council and has served on several other boards, including for the Puerto Rican Youth Development and Resource Center. She is the founder of CrossLeft.org. A former editor of BlogHer and current blogger on the Huffington Post, she has spoken at conferences worldwide including the World Bank’s Entertainment Education Conference, SXSW, BlogHer, Netculture in Canada, Politica2.cero in Spain and Social Media Day in El Salvador as well as conferences in Argentina, Uruguay and Paraguay. Among her recognitions and awards are: The Maynard Institute “31 Profiles of Women of Color in Digital Spaces”; the Huffington Post’s 2012 “7 Young Latinos In Online Media To Watch” and as a Politic365 “Game Changer” honoree. Her work has received the 2011 PRSA-NCC Thoth Award Category Winner in Global Communications, the 2012 Global Gold Sabre Award and finalist for the 2012 Cannes PR Lions awards. Esquivel graduated from Cornell University where she served on the Board of Trustees. She has also studied at NYU and Harvard Business School’s Executive Education Program. Originally from New York, Esquivel now lives in California. Brent A. Wilkes is the National Executive Director for the League of United Latin American Citizens this country's largest and oldest Hispanic organization. Wilkes manages the operations of the LULAC National organization with primary focus on national policy and legislative advocacy, membership development, program development, and resource development. A graduate of Dartmouth College in 1988, Wilkes majored in Government and Philosophy and studied Spanish in Morelia, Mexico. He has worked in various capacities for LULAC since 1988 including Special Projects Coordinator, Resource Developer, and Director of Policy & Development. He went to work for the LULAC National Office in 1996 and assumed the newly created position of National Executive Director in April of 1997. As the LULAC National Executive Director, Wilkes is working hard to improve the quality of life for Hispanic Americans by guiding LULAC on its way to becoming a million-member organization with extensive legislative, public policy, and service activities in Hispanic communities throughout the United States. Wilkes is widely credited with strengthening LULAC's programs, advocacy efforts, staffing, events and revenue since opening LULAC's National Office in Washington, DC in 1996. Since that time LULAC's revenue has tripled, staffing has grown from one to over thirty and the organization has taken a leadership role on key issues affecting Latinos in Washington and throughout the country. Wilkes currently serves as Vice-Chair of the National Hispanic Leadership Agenda a nonpartisan coalition of the major Hispanic national organizations which develops a consensus policy agenda and promotes public awareness of the principal issues facing Latinos. He is also an active board member of the Hispanic Association on Corporate Responsibility which advocates for the inclusion of Hispanics in corporate America at a level commensurate with Hispanic economic contributions. As a LULAC spokesperson, Wilkes frequently is quoted in national newspapers and publications and has appeared on radio and television shows including CNN, C-SPAN, MSNBC and Fox News among others. A recipient of numerous acknowledgements and awards, he is most proud of his LULAC Youth Advocate of the Year award presented in 2003. ESTUARDO V. RODRIGUEZ, JR. is a Principal and Counsel on Media and Communications at The Raben Group, where he brings years of experience with media and message development in addition to extensive experience with government affairs and specialized marketing to the Hispanic community. Mr. Rodriguez splits his portfolio between a number of non-profit organizations, which include the National Hispanic Leadership Agenda (NHLA), the League of United Latin American Citizens (LULAC) and corporate clients including Time Warner Cable (TWC) and the Property Casualty Insurance Association of America (PCIAA). In addition, Mr. Rodriguez serves as a Democratic Strategist and news commentator appearing on CNN, CNN en Español, Univision’s Despierta America, NTN 24, FOX News Latino, national and local Univision and Telemundo. He has also served the U.S. Department of State as an independent political analyst across Latin America and Europe, specifically Colombia, Bolivia, Chile and Spain, discussing the U.S. political process, the influence of the U.S. Hispanic vote, and U.S. policy toward Latin America. Priority projects and campaigns include the creation of the Friends of the National Museum of the American Latino 501(c)3, which seeks to create a National Museum of the American Latino on the National Mall in Washington, D.C., and the National Hispanic Leadership Agenda’s (NHLA) 2012 Public Policy Agenda, which outlines the priorities for the Latino community and sets the marker for the 113th Congress and White House Administration. The Agenda was presented at both the Republican and Democratic conventions in 2012. In addition, Mr. Rodriguez leads the Hispanics for a Fair Judiciary (HFJ) campaign, which focuses on the role of Latinos in the judicial appointments process and played a significant role in the debate and confirmation process of Justice Sonia Sotomayor. Mr. Rodriguez began his professional law career at the U.S. Department of Housing & Urban Development, where he worked as an attorney under Secretary Henry Cisneros and later Secretary Andrew Cuomo. Raised in Washington, D.C., Mr. Rodriguez received his Bachelor of Arts in Political Science and Philosophy from Barry International Catholic University in Miami, FL, and his Juris Doctor from St. John's University School of Law in New York City. Mr. Rodriguez is a co-founder and former President of the Hispanic Lobbyists Association (HLA), and member of the Hispanic Bar Association of D.C. (HBA-DC). Lou is the founder and CEO of Discourse Analytics an audience insights and segmentation company that enables campaigns, brands, publishers, media companies and organizations to better engage, create interest from and activate their members, consumers and/or audience. Recognizing the increasing challenges posed by the acceleration of mobile and social Lou saw the opportunity to build a company that uses psychographic profiling across multiple channels to drive better activation and engagement. Lou came to technology a bit later in life having been a practicing lawyer from 1990-2011 and having run his own law firm from 1997-2010. Despite having great fun as a law partner working with dynamic clients in diverse verticals Lou followed the “bolt of lightning” that hit in September 2008 to build a mobile phone based polling company. This entrepreneurial epiphany led to the creation of Discourse Analytics and its political division Votifi (SXSW Accelerator 2012 Finalist – Best Social). Having built and operated a multi-lawyer law firm for 13.5 years serving multiple clients in multiple industries, Lou realized that “who” people were was less critical to getting a deal done than understanding the “key drivers” behind those people’s decisions. This gave Lou the experience to disrupt the approach to human engagement through leveraged listening. Lou is a graduate of the University of Michigan and the Syracuse College of Law where he was a member of the Law Review. Lou is also a graduate of the Mindshare Class of 2012, a tumblr. fellow at the Personal Democracy Forum (2012), the Bull Run Beer Mile Champion (2009) and an Escape from Alcatraz Triathlon Finisher (2005).